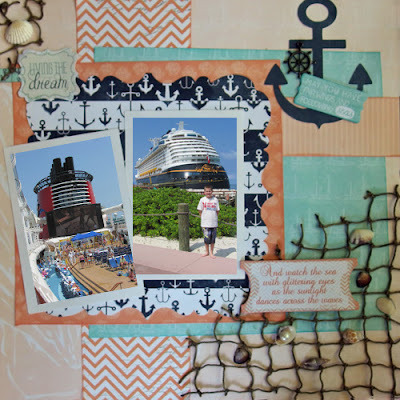 Hi Donna here today with a layout I did using Anchors Aweigh from Quick Quotes. With winter just around the corner, I wanted to scrap something summery to keep my mind off the upcoming chilly months. I love all three new lines from Quick Quotes, but this one is my favorite! Here are some photos from the Disney Cruise we went on, which by the way is soo much fun! I took some of this fishing netting and added to the corners, on top of the netting I placed this beautiful quote from the Anchors Aweigh chipboard set and placed shell randomly around the the netting. The one seashell I even placed a pearl in, well not a real pearl of course, but bling!